GP 2018 New Internet Offer 2GB Data Volume at TK42! 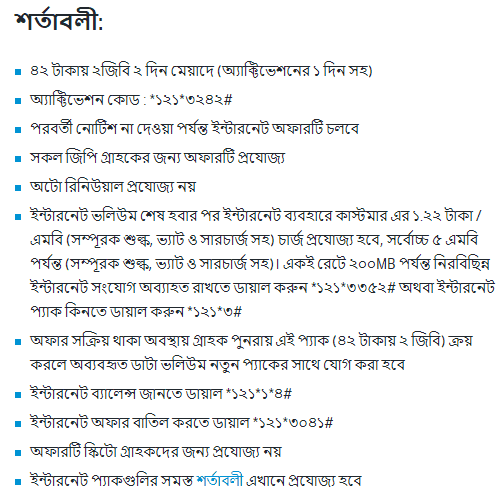 Grameenphone Limited recently started a fantastic Eid special internet offer for GP all customers. Only 42Tk 2GB internet with 2 days validity, customers can avail the offer multiple times during the Offer. This offer provides for Eid 2018. You can avail the 2GB internet offer at 42Tk (with SD + VAT + SC). The expiration will be 2 days. All prepaid and postpaid customers will be able to avail the offer without Skito. Request to dial *121*3242# to buy the proposal. To check Internet balance, dial *121*1*4#. Please visit our website to know more about the offer. The 2GB offer will eligible for all GP customers. The internet offer will continue until the next notice is issued. When the offer is activated, the available data volume will be added to the new pack when the customer purchases this pack (2GB at 42Tk). Dial *121*3041# to cancel Internet offer. All the terms of internet packs will apply here. After the Internet volume is over, the customer will have to charge 1.22 / MB (including additional duty, VAT, and surcharges) for internet usage, up to a maximum of 5MB (including extra duty, VAT, and taxes). Dial *121*3352# to continue uninterrupted internet connection at 200MB or internet pack for the same rate *121*3#. The Offer now enjoys only 38Tk 2GB. Thanks a lot for the visiting our new article ‘GP 2018 New Internet Offer 2GB Data Volume at TK42’ if you need any help with this 2GB @Tk42 offer, please comment us.